When Hannah Nichols last saw Marco D'Alessandro five long years ago, he broke her heart. The bad boy with a hidden sweet side was the only man Hannah ever loved. After one intense night, Marco took off, leaving Scotland and Hannah behind. Shattered by the consequences of their night together, Hannah has never truly moved on. Leaving Hannah was the biggest mistake of Marco's life - something he has deeply regretted for years. So when fate reunites them, he's determined to make her his. But just when Marco thinks they're committed to a future together, Hannah makes a discovery that unearths the pain she's been hiding from him - a secret that could tear them apart before they've had a real chance to start again . . . I have become a huge fan of Samantha Young since I first read On Dublin Street and I've really enjoyed getting to know this close knit group of family and friends as I've continued reading the series. Fall from India Place actually jumps forward about five years from the ending of Before Jamaica Lane and here we get to see Ellie and Braden's young sister as a grown woman. I was actually a little nervous that it might be weird seeing Hannah as an adult since I'm so used to seeing her as a teenager but Samantha Young did a fabulous job of laying the foundations for this story in the previous book and it didn't take me long to get used to the time jump. Moving forward five years also gives us the opportunity to catch up with all of our favourite couples and see how they're all getting on now, most of them are married and we also get to see a new additions to the extended family which was fun. Marco was Hannah's childhood crush and if you've read Before Jamaica Lane then you'll probably recognise him as the boy she was crazy about. The two were close friends but although Hannah always wanted more Marco kept her at a distance until one night when he gave into temptation. Hannah was heartbroken when Marco walked away from her after that and she was even more devastated when she found out he'd left the country and returned to America without even saying goodbye. Now, five years later, Hannah has done her best to put Marco to the back of her mind, she has worked hard to build a good life for herself and is just starting out in her career as an English teacher. She's never been able to trust another man with her heart but apart from that her life is good and she is happy being single. Bumping into Marco unexpectedly at a friend's wedding brings back all the old feelings of hurt and betrayal though. Marco is desperate to explain his actions and make things right between them but Hannah is wary of getting her heart broken again and he is the last person she can trust. I love a story about second chance romances so I was really looking forward to seeing Marco prove himself to Hannah. As much as I was annoyed at the way he hurt her in the past I think his actions were explained well and I believed how sorry he was for what he did. He had a good reason for leaving and although I think he should have come back sooner I could understand why he hadn't. I felt really sorry for Hannah in the beginning and could see why she was so determined to keep her distance from Marco but in the end I have to admit I started getting more than a little annoyed by the way she kept pushing him away. The tension and drama between them just felt a little overdone and it didn't help that they both had huge secrets that they were keeping. These secrets are even kept from the reader although I have to say they weren't hard to figure out so I knew what was coming long before the big reveal. I found it incredibly frustrating that every time the two of them seemed to come to an understanding something would happen to send Hannah running again. I could understand why she was wary but since Marco had such good reasons for everything he'd done I started to get irritated that Hannah kept blaming him for everything that had happened. I was also annoyed about Marco's secret, he should have been more upfront with her from the beginning and I didn't feel that the story needed the extra drama that the big reveal caused. Although this wasn't my favourite book in the series it was still an enjoyable read and I finished it in one sitting. 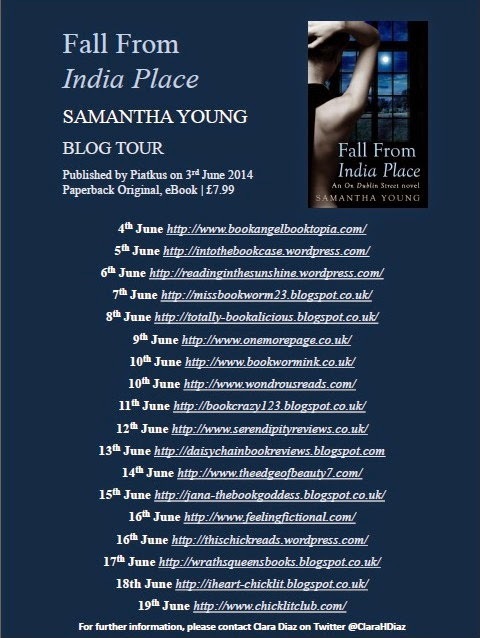 Samantha Young has created such a fantastic cast of characters and I love diving back into this world to see what they're all getting up to. The absolute stand out character in this book is Cole (Jo's younger brother) who is now a young man in his own right and who is such a fantastic friend to Hannah. I'm already half in love with him so you can imagine how excited I am that he's getting his own book! 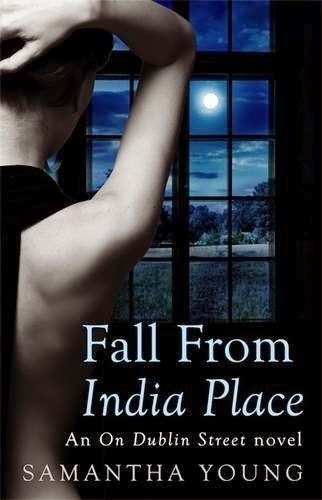 The UK paperback of Fall from India Place also includes the story Castle Hill which was previously only available as an ebook. Castle Hill is a fabulous novella featuring Joss and Braden that is set after On Dublin Street and if you haven't already had a chance to read it I'm sure you'll love it as much as I did. You can read my full review of Castle Hill HERE if you're interested.